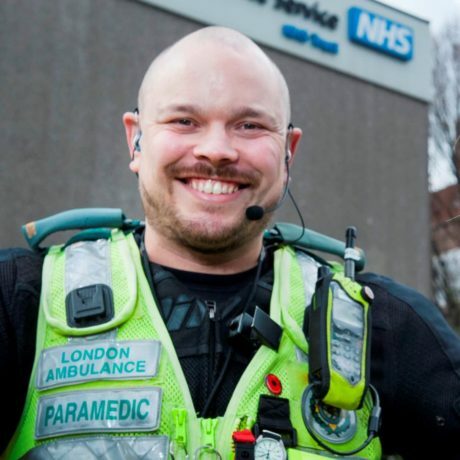 Richard Webb-Stevens is a paramedic who responds to 999 calls on a motorcycle. He can reach patients quickly and start to give lifesaving treatment while an ambulance is on the way. As regular motorcyclist, he gives us some advice on how to stay safe on the roads in London. What types of calls you attend? I attend everything from major trauma patients, including those with amputations and stab wounds, to people unconscious in the street or with minor injuries. We can reach patients quickly and cancel an ambulance crew if the patient isn’t as ill as first thought. The ambulance is then available to go to patients who are more seriously ill or injured. What are the benefits of being on a motorbike? You can beat London congestion and can access areas cars and ambulances can’t, such as narrow streets, parks and train station platforms. It means you can get lifesaving care to patients faster. How many miles do you travel a day? I can travel between 30 and 50 miles during a 12-hour shift. It doesn’t sound like much, but our running distances are only a one or two miles for each call. What’s it like riding around London on a motorcycle? It varies depending on the time of day. Some areas get very busy in the rush hour and some places remain busy all day. You need to be aware of the kinds of drivers and people who are using the roads, and always be alert. For example, in central London tourists who aren’t used to cars driving on the left can sometimes walk out in front of traffic while looking the other way. What are your top tips for motorcyclists in London? Check your bike before you go out and make sure everything’s working properly. We do what’s known as a POWDER check (Petrol, Oil, Water, Damage, Electrics and Rubber) so we make sure the bike is roadworthy before going out. Things such as checking all your lights work and checking your tyre pressures are really important. Expect the unexpected. Always give yourself enough room to brake safely. Always check your mirrors and do a shoulder check, looking behind you, before changing road position. Wear appropriate gear for the time of year. In summer wear ventilated clothing and appropriate UV eye protection. In winter make sure you layer up. Bespoke motorcycle trousers (leather or otherwise) and jackets with ‘CE certified armour’ are the European standard and offer the best protection if you’re involved in an accident. Motorcycle gloves and boots will be the difference between a graze and something more serious. Wear hi-visibility clothing, particularly in poor weather conditions.